This week we’re thankful for social science research on constructive family conversations, affirmative action in Brazil, transracial siblings’ mistaken identities, and school closings in Chicago. And don’t forget to send us your submissions for The ‘Teach with TSP’ Contest by the end of the month! “Table Talk for Thanksgiving,” by TSP Grad Board. For Thanksgiving, we brought back research about what family meals mean and how engaging in constructive conversations about political issues may be fruitful. 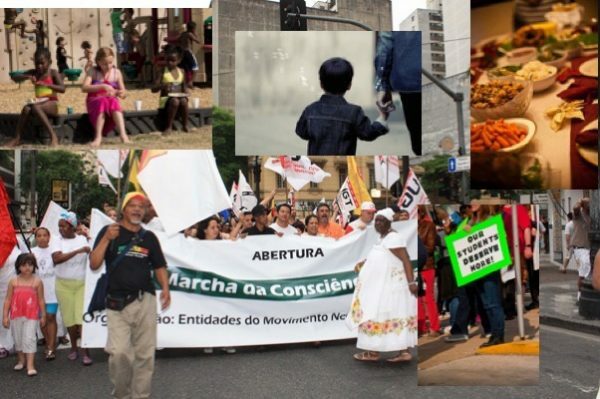 “Race and Affirmative Action in Brazil,” by Lucas Lynch. In light of the election of right-wing candidate Jair Bolsonaro who has been openly critical of Blacks and the LGBT community, we rounded up research on affirmative action policies in Brazil. “How Transracial Adoptees Combat Mistaken Identities,” by Mark Lee. New research in The Sociological Quarterly finds that transracial adoptees and their siblings are often mischaracterized and develop strategies to respond. “School Closings and Structural Racism in Chicago,” by Jasmine Syed. In a recent interview with Morning Shift radio, Eve Ewing describes systemic issues that contributed to public school closings and their impacts on communities of color. “In Mapping, Size Matters,” by Evan Stewart. “Taking a Knee,” by Simón E. Weffer, Rodrigo Dominguez-Martinez, and Raymond Jenkins. “The Data Behind the Headlines: What Research on the Newest Parenting Topics Really Reveals,” by Michelle Janning. Center for Holocaust & Genocide Studies reviews historians’ thoughts about the genocide that was perpetuated by Germany during the Herero and Nama War. Feminist Reflections reflects on labels and the lesbian generational divide.